The 2018 North American International Auto Show in Detroit is a little less than a month away, and BMW is planning a big splash with two world premieres. We will see the newest member of the X family: the first-ever BMW X2, and the updated 2019 BMW i8 Coupe plug-in hybrid sports car. 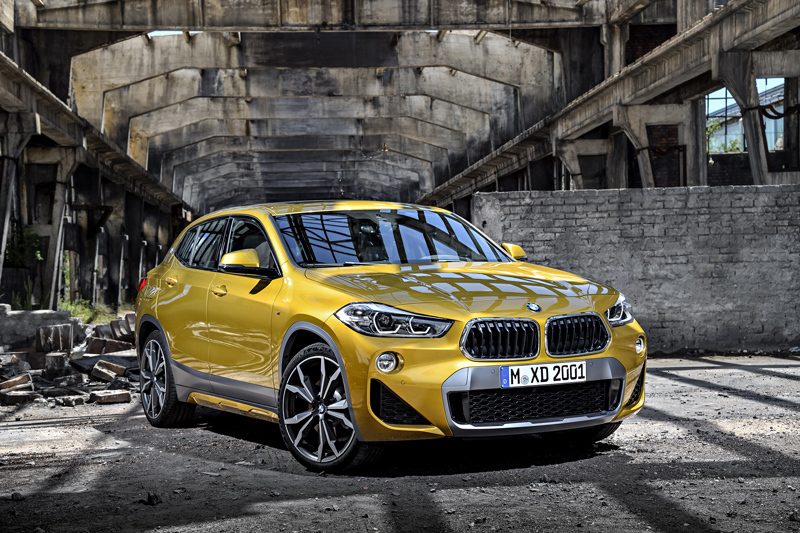 It's been almost a year since BMW took the wraps off the BMW X2 Concept at last year's Detroit auto show. That concept gave us a preview of some of the styling elements of the production X2, but a year later, there's nothing like the real thing. On January 15, 2018, BMW will hold a press conference in the Cobo Center in Detroit to unveil the all-new X2 Sports Activity Coupe, the svelter sibling of the BMW X1 Sports Activity Vehicle. Powered by a leading-edge 228 horsepower two-liter, four-cylinder engine with BMW TwinPower Turbo technology and an eight-speed automatic transmission, this entry-level crossover will move from zero to 60 miles per hour in 6.3 seconds. Expect the X2 to be in dealer showrooms in the spring. Pricing will be announced as we get closer to market launch. Earlier this month, the current BMW i8 Coupe was upstaged by the brand-new BMW i8 Roadster at the Los Angeles Auto Show, and rightfully so. After all, the i8 Coupe has been out for three and a half years now. The i8 Roadster is being built with a total of 369 horsepower from its electric and gasoline engines, and with the Lifecycle Impulse, the 2019 BMW i8 Coupe will get the same power bump. With the i8 Roadster now a reality, BMW can play up the fact that the Coupe is a 2+2, although the "+2" had better be small people or medium-sized luggage. The i8 Coupe gets more power and also more electric range with the lithium-ion battery cells' power increased from 20 to 34 Ah and a gross energy capacity of 11.6 kilowatt hours, up from 71. The official power figures for the 2019 i8 Coupe—and the 2019 i8 Roadster, for that matter—are 369 horsepower and 184 pound-feet of torque. The i8 Coupe's zero-to-60 time will be 4.2 seconds, about two-tenths of a second quicker than the slightly heavier i8 Roadster. Speaking of the i8 Roadster, it will be in Detroit, too, along with a contingent of electrified BMWs. In addition to the two i8s, BMW will have the i3, i3s, and the BMW X7 iPerformance Concept. While the 2019 BMW i8 Coupe will be having its world debut in Detroit, we expect the i8 Roadster will be getting most of the attention. It will be hard not to stare at a car with unique i8 styling, the i8 butterfly doors, and a retractable soft top. The BMW i3s is a new, sportier, and more powerful i3. The original i3 electric vehicle has been the best-selling premium compact battery-electric vehicle in the world since it arrived in 2014. The new BMW i3s has more horsepower at 184 and more torque at 199 pound-feet than the basic i3 and can hit speeds up to 100 miles per hour. We don't know what the range would be at triple digits but under normal driving, it's more than 124 miles. The concept that previews the upcoming BMW X7 Sports Activity Vehicle is a plug-in hybrid. BMW is making a statement with the BMW X7 iPerformance Concept to emphasize that while it will continue to build big sports activity vehicles, they can also be at least a little green. When the production version arrives later this year, it will be roomy, luxurious, connected, and in the case of the iPerformance variant, electrified. BMW M will also bring the first-ever BMW M3 CS that was introduced to the world last month at the Los Angeles show. This special-edition is a track car you can comfortably drive on the street, or a street car you can drive on the track—right out of the box. Carbon fiber has kept the weight down while the inline six has received a power bump to 452 horsepower and 443 pound-feet of torque. The ability to go from zero to 60 miles per hour in 3.7 seconds makes it the quickest M3 so far. May 2018 is the target date for arrival in this country, but remember, it is a special edition so there will not be an unlimited supply. BMW will tell us the price as May approaches. While not an M or an i vehicle—yet—the 2018 BMW X3 will probably have a much greater impact on BMW's bottom line and consumer reputation than any of the other cars on the BMW stand at Detroit. The third-generation X3 premium compact Sports Activity Vehicle has to perform, handle, carry people and stuff, and represent a good value. So far, reaction to the new X3, which began production last month, has been very positive. With a 50:50 weight distribution and xDrive, the X3 is a balanced handler and rather quick for its weight. Zero to 60 gets done in 6 seconds flat, thanks to its two-liter TwinPower Turbo four-cylinder inline gasoline engine and eight-speed Steptronic Sport automatic transmission. The BMW X3 is available now with a suggested price of $42,450 plus $995 Destination and Handling.